Perfect for all sorts of photographic events, this album will happily take photos from holidays, weddings or any type of family celebration, as it has a classy cover, which is very traditional and non-specific. 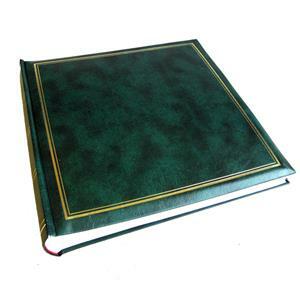 The Classic Green traditional Album measures approximately 11.75 x 11.75 inches, so will easily take a 10x8 inch photo per page, but also takes upto 400 6x4 photographs. Each of the 50 white book-bound pages, are made from lightweight card and there are glassine interleaves between each page to stop the photographs from sticking to each other when the album is closed. The card is acid free, which means that the photographs will not be compromised over the years and the pages are great for anyone who wants to document a holiday, by using all the tickets and postcards that are picked up on the way. The gold framing around the edge of the cover contrasts really well with the green background and creates a luxury feel to the album. There are three other colours available in the range, so plenty of scope for mixing and matching.